If a suicide bomber had detonated himself in a pew at St Peter’s Basilica while the Pope of Rome was presiding over the liturgy, the world’s media would be talking about an assassination attempt on the life of Francis, which it surely would have been. When a bomb or a bullet gets within a whisker (that is to say, within a church compound) of a pope at prayer, it may reasonably be surmised that the target is that praying pope. Why else would a rather devout Muslim seek to outfox security to gain entry to an iconic church on that particular day? It’s not likely to be for inter-religious dialogue and ecumenical fellowship, is it? 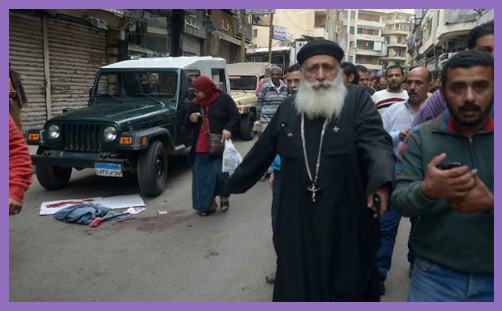 But when a suicide bomber tried to gain access to St Mark’s Coptic Orthodox Cathedral in Alexandria on Palm Sunday while the Pope of Alexandria was presiding over the liturgy, the world’s media seemed to ignore the presence of Tawadros II, for some reason, as though he were a bit player in a fringe play. To around 18 million Coptic Christians worldwide, he isn’t ‘a pope’; he is His Holiness the Pope, Patriarch of the See of St Mark in the Province of Alexandria, Egypt, Pentapolis, Libya, Nubia, Sudan and all Africa, with an apostolic lineage going all the way back to 42 AD. A bomb going off in his historical seat is an attack on him. Alexandria’s pontiff doesn’t get as many column inches as Rome’s; perhaps he isn’t supreme enough. But you’d think an assassination attempt on his life – however amateurish and botched – would merit a few headlines, wouldn’t you? The mainstream media have condemned the Palm Sunday outrage with an outpouring of sorrow and sadness, compassion and prayers, and column inches dedicated to political assurances that more will (or must) be done. But no mention at all that Pope Tawadros II was the likely target. Make no mistake, this was an attempt on the life of the Pope – not that Pope, but this one. And he is very vulnerable: if a photographer can snap a priest dashing down the street among his bloodied and dazed congregants, it really wouldn’t take much for a Daesh sniper to take a potshot at the Pope – they are rather conspicuous targets. Islamists might be politically fractured and theologically fragmented, but they are united in their belief that the Pope must die – this one and that one, along with both the others. Daesh might have failed this time, but they will surely try again: “Crusaders and their apostate allies should know the bill between us and them is very big and they will pay it with rivers of blood from their children, God willing,” they announced shortly after the massacre. “Wait for us, for we will wait for you,” they added, as they lie in wait for the Pope of Alexandria to preside over another liturgy somewhere in his province. There’s no easy hiding. Pope Tawadros II is the ecclesiastical equal to all the other popes and patriarchs, and the mainstream media ought to recognise and respect this. His jurisdiction was established at the Ecumenical Council of Nicaea in 325, and his forebears were present at the Council of Ephesus in 431, and at Chalcedon in 451. The Copts are not some quirky fringe Middle-Eastern cult, but true defenders of the Apostolic tradition and of Catholic and Orthodox doctrine. They are part of the Body of Christ; in us and with us, and we with them. When they bleed, we hurt. If they are decapitated, we lose a mind of mercy and a soul of grace. The massacre of dozens of worshipping Coptic Christians is a barbarous sacrilege. An attempt on the life of His Holiness Pope Tawadros II is a sacrilegious blasphemy. Quite why the Anglican Communion News Service and the Times of Israel seem to be alone in recognising the real target is something of a mystery.